Where did the term “Carat Weight” come from? Before the days of standardized weights, merchants had to rely on natural objects that were fairly common. Dried seeds were most favored for small weights, especially if they did not fluctuate much in weight from seed to seed. The dry grain of wheat, simply known as the grain, was commonly used. The grain was employed at an early time for measuring the weight of pearls and also diamonds. It was lighter than the carat and is now considered to be 50 milligrams or 1/4 metric carat. Currently, grains are not a legal weight for gemstones however the diamond trade occasionally refers to grains as a general indication of size, in the expressions a grainer, a one grainer, a three grainer, a six grainer and so on, for diamonds of about .25cts, .75cts, and 1.50 carat. Diamonds and other gemstones are normally measured in the very old unit weight, the carat. The word carat comes from the Greek name for the tree Keration meaning little horn which its bean pod resembles. The carat weight was originally the seed of a tree that is common in the Middle East, the Locust tree or Carob tree. Its fruit is an almost black bean. Inside the pod are sweet syrup and many small seeds. As commerce in gems increased, various countries standardized the carat in relation to their own units of weight, which varied. In London carat was therefore different from the Venice carat and both were different from a Madras carat. The current definition, sometimes known as the metric carat, was adopted in 1907 at the fourth General Conference on Weights and Measures and soon afterward in many countries around the world. Currently: 1 carat = 200 milligrams = 100 points. The carat is divisible into one hundred points of 2 milligrams each. This is where the term “Point” referring to diamond carat weight comes from. Diamond carat weight has come to represent particular sizes since diamonds are cut to specific proportions. As the size of a diamond increases, the price per carat increases significantly. Stones of the same quality weighing two carats will sell for far more per carat than the same quality one carat diamond. As you will see, the price of a diamond does not increase proportionately but exponentially as size increases and quality hold the same. Conversely when measuring the diameter of a two carat round diamond it is not twice the size in millimeters of a one carat diamond. It is important to remember that diamonds have length, width, and depth meaning they are three-dimensional. When a customer has a three carat round brilliant cut diamond and are looking to upgrade to a larger diamond, they need to consider a five carat round brilliant cut diamond as a four carat round brilliant cut diamond will not look appreciably larger than the three carat diamond. Due to distribution media – these are not true sizes; the diagram above is designed to give you a visual comparison of the different sizes. The price of diamonds is based on diamond quality and diamond carat weight. As the diamond carat weight increases the price per carat increases as the carat weight crosses predetermined carat categories. This is an extremely important point as price per cart increases significantly as cart weight increases. The following table will help to further illustrate the carat weight categories. Careful study of the Find My Rock Diamond Price Guide will clarify this point. Everyone wants a 1.00 carat or a 2.00 carat or a 5.00 carat diamond. 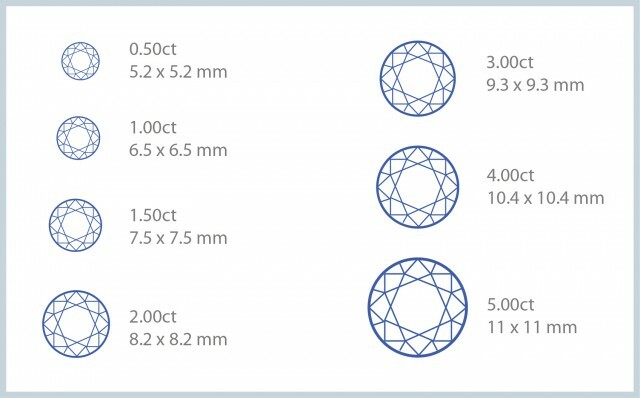 The problem is they have preconceived ideas of these carat categories without thoroughly understanding millimeter size. 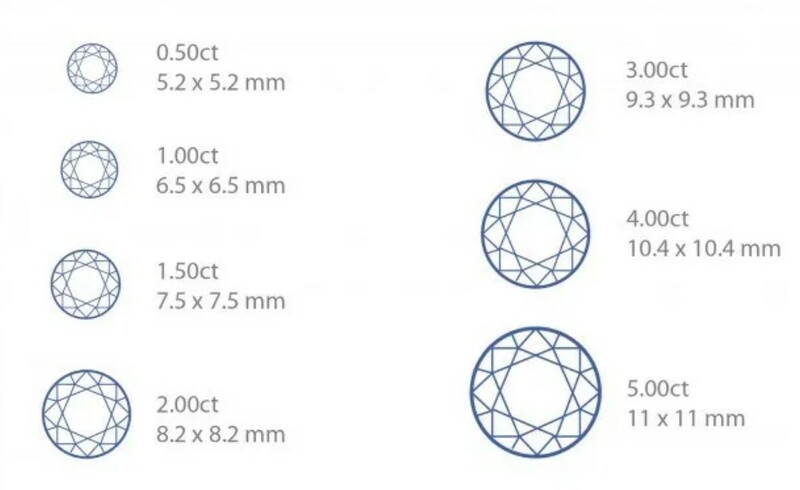 The fact is the eye can see millimeter size but due to the three dimension character of diamonds have no clue what the carat weight actually is. This is due to the cleaver marketing of diamond by DeBeers since 1950’s with their “Diamond Are Forever” 4C’s advertising campaign. This is where you can save a ton of money! It is very difficult to honestly tell the difference between a .95 carat round brilliant cut diamond and a 1.02 carat round brilliant cut diamond. In Fact depending on cutting the .95 carat diamond could look larger than the 1.02 carat diamond. This fact is magnified in the larger sizes and prices! Holding diamond quality constant compare prices just under the carat weight category you are seeking. If you insist on a full plus carat size do not buy exactly 1.00 carat or 2.00 carat diamonds. If you chip your diamond you will lose a great deal of money as your re-polished diamond falls into the next carat weight category down. In fact it is always prudent to buy at least a 1.02 carat or 2.02 carat or 5.02 carat diamond. Give yourself a reality check if you are required to buy a 3.00 + carat diamond when a 2.95 carat will save a bushel of money and you cannot see the difference in millimeter size holding diamond quality constant.